Situated on Lake Avenue in Bay Village is the amazing place known as Bay Arts – a mecca of art education, and a celebration of the arts on the west side of Cleveland. BayArts – art education, galleries and a fabulous gift shop with hand made local art. 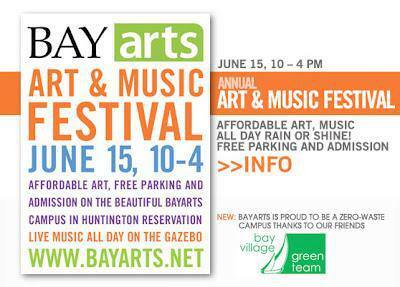 Annually BayArts brings 40-50 artists to a one day festival on the lawn of their building, the former gatekeeeper’s house for the Huntington Estate. Huntington was Rockefeller’s lesser known business partner at Standard Oil (Now owned by British Petroleum or BP). The grounds are landscaped beautifully, and the air is filled with wonderful music and the smells of good eats.